I can't listen to Meklit without hearing her smile. Part of this, surely, is having met the singer in person and knowing she does in fact have a radiant smile, but it's also in her music: a deep, self-possessed joy at the center of her songs, driving them forward along with East African percussion -- even if the topics she sings about aren't all sunshine and butterflies. When the People Move, The Music Moves Too, Meklit's fifth studio record, is no exception: featuring the versatile talents of Andrew Bird on two tracks and brass firepower of the Preservation Hall Horns on five, the new full-length is uplifting, feel-it-in-your-gut, and not officially out until June 23. 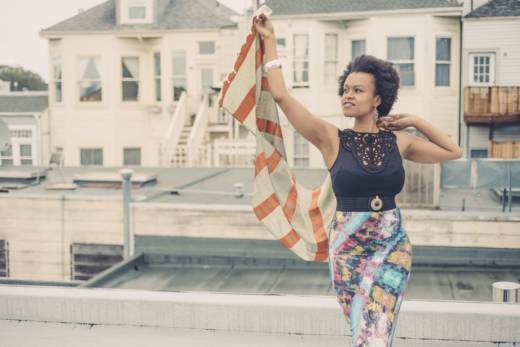 But those of us lucky enough to live in the same place as the Ethiopia-born, Oakland-dwelling musician -- and TED Senior Fellow, NBD -- have a chance to hear the songs performed live six weeks ahead of time, with her local record release show this Saturday, May 6, at the Rickshaw Stop. The powerful presence of drums throughout the record is no accident, Meklit recently told the San Jose Mercury News. It was inspired in part by the Nile Project, a nonprofit Meklit co-founded that connects musicians from across that vast African region. Performing with that group over the last year or so, says Meklit, "there were actually three percussionists, and that’s like a supercharged engine underneath you." Add in instruments like the krar, a traditional Ethiopian harp, and the result is a record that leaps all over the map, genre-wise: there's jazz, New Orleans funk and soul, and a cool layer of what we'll call Bay Area air -- a little sweet, a little salty, and entirely unconcerned with convention. Oh, and for jazz fans, another reason to smile: Local saxophone legend Howard Wiley will be touring with Meklit for this album's release. Meanwhile, at the Rickshaw, Afro-soul singer Zakiya Harris serves as main support. Considering it's is a hometown show, there's no telling who else might show up. Meklit's record-release show (with Zakiya Harris and DJ Heylove) takes place at 9pm on Saturday, May 6, at the Rickshaw Stop in San Francisco. Tickets ($25) and more info here.